In his sixth annual New Years address, Kim Jong Un stated that the United States can't wage war against his country in any form because he had "the entire mainland of the U.S." within reach of his intercontinental ballistic missiles and that he has a "nuclear button" always on the desk in his office. The young tyrant emphasized that "this is not a threat but a reality." Hopefully he is speaking metaphorically about the "nuclear button" on his desk as executive command and control architecture for nuclear weapons release is often referred to as "the button" but in reality it is usually more complex than that. Then again, Kim Jong Un has been frighteningly accurate with his statements regarding North Korea's nuclear program. Just last year, during his fifth New Years address, Kim stated that he was entering the "final stages" of preparations for a test launch of a ICBM. At the time many discounted this claim as bluster, but they would later find out that it was all too true. The mental image of North Korea's already comic book-like super villain leader having a big red button on his desk that would bring about a massive war, and even a nuclear exchange, on a whim is bordering on Dr. Evil territory. But who knows, the ultra paranoid leadership in Pyongyang knows full well that their command and control systems would come under near instant electronic and cyber attack—and eventually kinetic attack—the second hostilities are detected, so simplifying and turbocharging the command release procedure for the country's nuclear stockpile could very well be a primary goal of the regime. At the very least it would lend credibility to the country's nuclear deterrent, albeit in a terribly frightening way. At the same time it could mean recalling the country's nuclear forces once an order is given could be near impossible. Kim's New Years message also deviated from the usual bellicose rhetoric into a bit less combative messaging, stating that his nuclear nation "loves peace" and that as long as there isn't any aggression against him and his people he "doesn't intend to use nuclear powers." At the same time, the address gave no signs that Kim's regime has any intentions of giving up its nuclear arsenal or missile programs. BMW's i-division has been the automaker's key to electrified success ever since it matured from the test bed that is the Mini brand. Now, the German automaker has decided to lend its technology to a delivery courier which plans to electrify its own local fleets, DHL. Something you might not know about DHL is that the freight handler is actually the parent company of an automaker, Streetscooter. In 2014, DHL acquired the then-four-year-old electric car startup in an effort to go green and began developing electric vehicles suited more towards the parent company's needs. As part of its program, Streetscooter will outsource various parts of the manufacturing process, including that of its batteries, sourcing them from BMW rather than developing the technology itself. This isn't necessarily a new process, as DHL has historically purchased vehicles from a wide variety of manufacturers other than the one it owns. "The choice of BMW i battery modules for the Streetscooter is further proof that robustness, innovation and sustainability in future-oriented drives are by no means mutually exclusive," said Dr. Alexander Kotouc, BMW's i-division's Head of Product Management, in a press release. "The successful transfer of state-of-the-art automotive technology, even in the challenging field of postal and parcel delivery, testifies to the farsightedness and universality of the BMW i concept." It's an interesting choice to see DHL choosing BMW as its supplier of battery packs rather than a company such as Tesla, which has been pumping out batteries for quite some time in its Gigafactory. It is possible that the modular design that BMW uses with the i3 better fits the platform, are more cost efficient, or DHL simply sees a reason to use them above other manufacturers. Regardless, this is a win for a manufacturer that is boldly stepping foot into the EV game with a running start. Police in Astoria got a call yesterday about a guy trespassing on some boats. When they showed up, he drove off. And by "off", I mean off a pier & into the Columbia River! He's alive, in jail and facing a long list of charges. 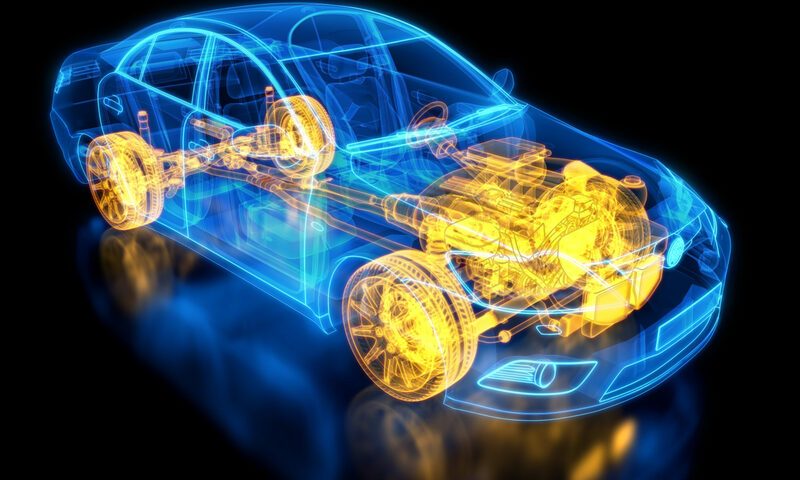 Key industry players, such as General Motors, Continental, and Honda, believe electricity to be the propulsion method of the (near) future, whereas others like Lamborghini and Mazda, think that internal combustion will remain viable for some time. The former does not yet see electric vehicle technology—or its supporting infrastructure—as superior to that of the established internal combustion market, and the latter promises to keep a naturally-aspirated V-12 engine as the centerpiece of its flagship model. We at The Drive are fans of interesting vehicles going up for auction, especially movie cars. Being in a movie can increase a car's value much like a car being previously owned by a celebrity, but what about a car that filmed a motion picture? Examples like the Mustang star car from the 2014 film Need for Speed sold for $300,000 for charity, so it's only reasonable that the chase vehicles should get some love, too. For the upcoming Barrett Jackson Scottsdale 2018 event, a heavily modified Mustang camera car will be going up for auction with no reserve. The Mustang was used to film the movie Need for Speed as well. It is a 2013 Mustang GT (VIN 1ZVBP8CF0D5199818) and only has 7,780 miles. The car features the Mustang GT's normal 5.0-liter Coyote V-8 engine mated to a six-speed manual transmission. According to the Barrett Jackson auction listing (Lot# 1572), the Mustang camera car was modified by Saleen for the purpose of the movie. It is equipped with 14-inch Saleen slotted brake rotors and calipers among other modifications. The listing neglects to mention the Saleen supercharger that was added to the car which, in some trims, can bump the Mustang's power up to 625-horsepower. The car has been significantly modified to be a better camera car. It has a custom-built roll cage and a modified rear/trunk area to accept the camera crew as well as custom front and rear bumpers including mounts for gyroscopic cameras. The front passenger airbag was removed to allow room for additional electronic camera needs. The car is being sold as "camera equipment" according to the bill, so your results may vary on getting it registered for the road. You can see the car being built and used as a camera rig in the following video. I am sure some YouTuber is dying out there to take this to H2Oi 2018 to dodge the potential "hanging out the car filming" tickets. As noted in The Drive earlier this month, Lockheed Martin is now working with Aerion Corporation to develop a 12-passenger business jet that could fly at Mach 1.4—nearly twice the speed of most commercial airliners. The plane, dubbed the AS2, is expected to begin deliveries in 2025 at a reported cost of $120 million. Aerion announced that, with the right atmospheric conditions, it'll be able to fly at speeds approaching Mach 1.2 without a sonic boom reaching the ground. The jet is in the vanguard of a rebirth in civilian supersonic travel with promises of speed up to Mach 2.2. Mach is a measure of the speed of sound in air and it generally decreases with altitude. At sea level, the sound barrier (Mach 1) equates to 761 mph, but at 50,000 feet of elevation, it's 660 mph. Though military planes have broken the sound barrier since the late 1940s, civilian supersonic travel took a couple of decades to catch up. It was achieved from 1976 to 2003 by the Concorde, which topped out at Mach 2.04, and by the Soviet Union's similar-looking Tupolev TU-144, which flew from 1977 to 1983 and could reach Mach 2.15. Earlier supersonic passenger planes failed because of cost and sound levels. They used more fuel and were much more expensive to operate than sub-sonic planes their size. Plus, the sonic boom they created breaking the sound barrier made them abrasively loud to operate over land, leading a ban on commercial flights hitting supersonic speeds over the continental U.S. There are currently several business jets that can approach Mach 1, including Gulfstream's flagship G650ER, which hits Mach .925, and Cessna's Citation X+, the fastest business jet currently in production with a top speed of Mach .935. Most commercial airliners top out below Mach .9, including Boeing's 747-8, the largest commercial aircraft built in the U.S. The return of viable supersonic flight is great news for business travelers. It'd make the journey from New York to London or Paris into a viable day trip, for example, and would facilitate business between Asia and North America by knocking more than a dozen hours off round-trip travel times. If claimed speeds are accurate, the AS2 is actually the slowest of the three supersonic civilian planes currently under development. The first of these likely to hit the market is from a start-up in Colorado. Denver-based Boom Technology aims to have a 55-seat commercial jet capable of hitting Mach 2.2 on the market in 2023. The $200 million jet has already garnered interest from airlines looking to boost their high-end offerings. Virgin Group signed an agreement to partner with Boom back in 2016, and Japan Airlines recently invested $10 million with the firm. Boom says its jet can travel between New York to London in 3 hours and 15 minutes—less than half the time a regular commercial airliner takes—and tickets will cost $2,500 each way. The company also claims its jet will be at least 30 times quieter than the Concorde when crossing the sound barrier, which might eventually see it approved for supersonic flight over the continental U.S.
Another company, Boston-based Spike Aerospace, is developing a business jet capable of holding up to 18 passengers at speeds up to Mach 1.6. The company states its S-512 Quiet Supersonic Jet will cost $100 million and offer patent-pending technology to make it quiet and non-disruptive to those on the ground. Aerion, Boom, and Spike are new-ish companies, and it remains to be seen if all three of their planes come to market on time. But chances seem likely that in the not-too-distant future business people and the well-heeled will once again be able to slip the surly bonds of Earth with haste.